Danny Garcia turned back the challenge of Argentina's Lucas Matthysse Saturday night in a lively 12-round junior welterweight title fight at the MGM Grand in Las Vegas. Matthysse was the betting favorite and the popular choice by both fans and media prior to the fight. However Danny Garcia delivered a performance that not only captured the important victory and defended his belts, it also proved to a doubting public that he is without question the best 140-pounder in the world today. As if the formidable challenge of Matthysse wasn't enough, Garcia was also fighting for respect Saturday night, a respect that was long overdue after an incredible 18 months of boxing that should have made believers out of even the most skeptical of observers. However boxing is a tough sport with both "experts" and devotees of the game highly susceptible to falling for the latest and greatest bandwagon that rolls along. Garcia was underappreciated by many because of Matthysse's punching power and sudden air of invincibility. 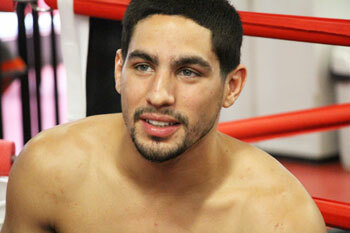 The fans fell for it, but Danny Garcia did not. If Garcia's wins over Morales (twice), Khan, and Judah didn't earn him the respect he's deserved, then this unanimous decision over the feared and heralded Lucas Matthysse certainly should. The fight was a competitive battle with both boxers having their moments. However, it was Garcia who fought the smarter fight and had the better overall skills. Matthysse proved to be a hard-nosed and heavy-handed foe, but when he landed with his weighty shots, Garcia was still standing and more than willing to engage. This obviously surprised both Lucas and his legion of followers. By round four, Garcia began to look extremely comfortable in the fight. He was landing jabs, countering with hard left hooks, straight rights, and had begun working Matthysse's body. Some of Garcia's body blows strayed low, and he was warned by referee Tony Weeks on several occasions. In round five Matthysse appeared to wobble Garcia at the bell, and continued the rally in round six. But Garcia was tough and took the punches well. Danny remained in range, weathered every storm and fired his own artillery. In round seven, a mouse under Matthysse's right eye suddenly blossomed and left him nearly blind on that side. Garcia continued to punish the wound with the jab and left hook that had caused it. Down the stretch, Matthysse appeared to be wearing down and running out of ideas. He never became desperate, but you could tell that he was feeling the pressure and that his hopes of rolling over Garcia were dissolving. Garcia fought beautifully over the next few rounds, carving out a comfortable lead. However, Matthysse remained dangerous. Garcia remained focused. Matthysse opened round eleven with a rocket of a right hand that jarred Garcia and sent his mouthpiece flying out of the ring. Lucas followed up with a series of hard shots and did his best to turn the fight his way. He was having a very good round most of the way, but then Garcia caught him on the ropes and delivered a combination that floored Matthysse. Lucas got up gamely, but the trip to the canvas nullified his best round of the night. In the final round, Garcia was closing the show and boxing comfortably, when one of his body shots fell far below the beltline and resulted in a one-point penalty. It was a moment of dread for Garcia fans, who had already begun worrying about the competency of the three official judges. However, when the final tallies were read, Garcia had an edge on all cards. Judge Robert Hoyle scored the fight 114-112 for Garcia. Judge Juergen Langos concurred, 114-112. Judge Glenn Trowbridge had it the widest at 115-111. My card read 115-112 for Garcia. Both fighters showed good sportsmanship afterward, with each praising and respecting the other. It was an action-packed fight, if not the glorious brawl many had imagined. Garcia, 27-0, 16 KOs, fought too smartly to let the contest become an unruly affair, and Matthysse, 34-3, 32 KOs, was not able to crush Danny as he had so many of his other panic-stricken opponents. The victory for Garcia told a tale of a young champion who was far better and more capable than many gave him credit for. He did everything he needed to do against an opponent that figured to be the toughest of his career. It wasn't an easy victory, but Garcia made it look easy. Danny Garcia is a legitimate world champion and has completely cleaned out his division. He is tougher, smarter, more skilled, and simply better than most believed. He also had the courage and class to face an opponent that so many feared. In the end, Garcia was just the better fighter. Garcia had the better chin, he scored the only knockdown, he was faster, smarter, and had no fear in the fight. He did not run; he stood and fought with the one most feared punchers in the game. Against Garcia, Matthysse proved to be a very good fighter, but his invincibility was a myth. Going into the fight, Danny was considered good, but against Matthysse, he proved that he is much, much more than that. Understand that I believed this all along. I'm just recapping it for all of those doubters. Any further questions for Garcia? 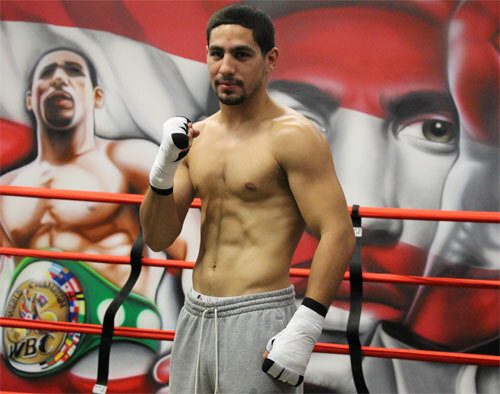 Welcome to the Danny Garcia chapter of Philly boxing history. NOTE: Floyd Mayweather dominated Saul "Canelo" Alvarez in the 12-round main event. Canelo was tough, but could not come close to matching skills with Mayweather. There were no scares for Mayweather, just a typical day at the office. Somehow one of the official judges scored the fight even. Thankfully the other two had Mayweather well ahead. I gave Floyd all 12 rounds. Chances are Garcia's win over Matthysse will earn him a crack at Mayweather and the welterweight crown in 2014. It's a big challenge, but that seems to be the name of Garcia's game.